The Exe Suites Reforma Hotel is right in the heart of exciting Mexico City, offering 36 luxury suites, equipped with everything to cater for all the needs of the contemporary, discerning traveller. Each of the loft suites are bright and airy, and drenched in natural light to create the feeling of bringing the beautiful surroundings indoors. Each has a king sized bed, a luxurious en-suite bathroom, free Wi-Fi and cable television amongst many other features. The friendly team of staff are eager to help you with your questions, and happy to give you information about what to do and see in the area, to ensure that your holiday to Mexico will be unforgettable. 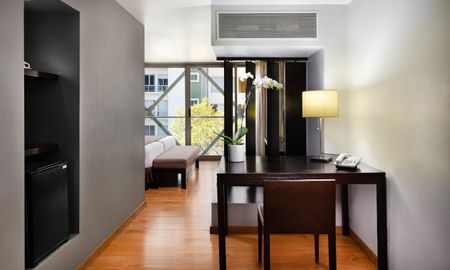 The Exe Suites Reforma Hotel is in a convenient location for exploring the city – it is right in the middle of the business district, meaning that business travellers will have a stress-free trip. Just a few steps from the hotel are the Mexican Stock Exchange, the most important banks, and many of the embassies. For those in search of a holiday to Mexico City, some of the best attractions are just a few minutes away on foot. The Ángel de la Independencia Monument, the National Auditorium, the Archaeological Museum, the cobbled streets of the San Ángel Quarter, and the Mariachi bands of Garibaldi Square are just a few of things to see and do in this bustling city. Special conditions may apply when booking more than 6 rooms. Kindly note that the hotel has the right to pre autorize the credit card any time after the booking.